5-1 –Depeche Mode Get The Balance Right! 5-2 –Depeche Mode The Great Outdoors! Published By – Chappell Morris Ltd. Published By – Habana Music Publishing Ltd. Published By – Wintrup Songs Ltd. Published By – Mirror Music Publishing Co. Ltd. Published By – Cherry Red Music Ltd. Published By – Mega Music Ltd. Published By – Interzone Music Publishing Ltd. 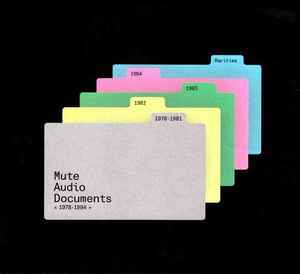 This Compilation (P)&(C)2007 Mute Records Ltd.
Collection of Mute's single releases from 1978 to 1984 coming with a compact-disc sized 76-page book "Documentary Evidence" with sleeve notes, original artwork and exclusive original poster for The Normal packed all together in a box. The series features all the A-side and B-side single tracks released by Mute in addition to album tracks by the artists for whom there were only album releases. 1-1 published by Mute Song Ltd.
1-2 published by Blue Mountain Music Ltd.
1-3 published by Jewel Music Publishing Co. Ltd.
1-4 published by Chappell Morris Ltd.
1-5 & 1-6 published by Habana Music Publishing Ltd. Recorded at RMS Studios, London 1979. 1-7 published by Layback Music / Werdna Music / Su-Ma Publishing Company Inc. / MCS Music Ltd. Recorded at Blackwing Studios, London. 1-8 published by Mute Song Ltd. Recorded at Blackwing Studios, London. 1-9 & 1-10 published by Habana Music Publishing Ltd. / Mute Song Ltd. Recorded at Blackwing Studios, London 1980. 1-11 & 1-12 published by Gema / Wintrup Songs Ltd. Recorded at Cargo Studio, Rochdale. 1-13 to 1-17 published by Mute Song Ltd.
1-18 & 1-19 Copyright Control. 1-20 & 1-21 published by Habana Music Publishing Ltd. Recorded at Blackwing Studios, London 1980. 2-1 published by Mirror Music Publishing Co. Ltd. Recorded at Margaritte Studios, London. 2-2 published by Mute Song Ltd. Recorded at Blackwing Studios, London. 2-3 & 2-4 published by Cherry Red Music Ltd. / Complete Music Ltd. Recorded at Blackwing Studios, London, August 1980. 2-5 & 2-6 published by Gema / Wintrup Songs Ltd.
2-7 & 2-8 published by Musical Moments Ltd. / Sony Music Publishing (UK) Ltd. Engineered at Blackwing Studios. 2-9 & 2-10 published by Mute Song Ltd.
2-11 published by Habana Music Publishing Ltd. Recorded at Blackwing Studios, London 1981. 2-12 published by Habana Music Publishing Ltd. / Mute Song Ltd. Recorded at Blackwing Studios, London 1981. 2-13 to 2-16 published by Musical Moments Ltd. / Sony Music Publishing (UK) Ltd. Recorded at Blackwing Studios. 3-1 published by Mute Song Ltd. Recorded and mixed at Blackwing Studios, London. 3-2 published by Mute Song Ltd. Recorded live at SO36 Berlin and mixed on location. 3-3 published by Mute Song Ltd. Recorded in California. 3-4 & 3-5 published by EMI Music Publishing Ltd. Assigned by Grabbing Hands Music Ltd. Recorded at Blackwing Studios, London. 3-6 published by Habana Music Publishing Ltd. Recorded at Blackwing Studios, London 1981. 3-7 published by Habana Music Publishing Ltd. Recorded live at the Venue 8/12/81. 3-8 published by Gema / EMI Music Publishing Ltd. Recorded at Geisterfahrer Studios. Mixed at Studio Lambertz-Brahm, Düsseldorf. 3-9 published by Copyright Control. Recorded at Geisterfahrer Studios. Mixed at Studio Lambertz-Brahm, Düsseldorf. 3-10 & 3-11 published by Mute Song Ltd. Recorded live at Kelbos in Los Angeles, SO36 in Berlin, The Film Makers Co-op in London, Bains Douches in Paris, Ratinger Hof in Dusseldorf and the Whiskey A Go-Go in Hollywood. 3-12 & 3-13 published by Habana Music Publishing Ltd. Recorded at Blackwing Studios, London. 3-14 & 3-15 published by EMI Music Publishing Ltd. Assigned by Grabbing Hands Music Ltd. Recorded at Blackwing Studios, London. 4-1 & 4-5 published by Musical Moments Ltd. / Sony Music Publishing (UK) Ltd. Produced at Blackwing Studios. 4-2 published by Musical Moments Ltd. / Mega Music Ltd. / Sony Music Publishing (UK) Ltd. Produced at Blackwing Studios. 4-3 & 4-4 published by Gema / Wintrup Songs Ltd.
4-6 published by Mega Music Ltd. / Sony Music Publishing (UK) Ltd. Produced at Blackwing Studios. 4-7 & 4-8, 4-13 & 4-14 published by Habana Music Publishing Ltd. Recorded at Blackwing Studios, London 1982. 4-9 & 4-10 published by EMI Music Publishing Ltd. Assigned by Grabbing Hands Music Ltd. Recorded at Blackwing Studios, London. 4-11 published by Musical Moments Ltd. / Mega Music Ltd. / Sony Music Publishing (UK) Ltd. Recorded at Blackwing Studios. 4-12 published by Mega Music Ltd. / Sony Music Publishing (UK) Ltd. Recorded at Blackwing Studios. 5-1 published by EMI Music Publishing Ltd. Assigned by Grabbing Hands Music Ltd. Recorded at Blackwing Studios, London. 5-2 published by EMI Music Publishing Ltd. Assigned by Grabbing Hands Music Ltd. / Sony Music Publishing (UK) Ltd. Recorded at Blackwing Studios, London. 5-3 & 5-4 published by Mute Song Ltd.
5-5 & 5-6 published by Gema / Warner Chappell Music Ltd.
5-7 published by Mega Music Ltd. / Sony Music Publishing (UK) Ltd. Recorded at Blackwing Studios. 5-8 published by Musical Moments Ltd. / Mega Music Ltd. / Sony Music Publishing (UK) Ltd. Produced at Blackwing Studios. 5-9 published by EMI Music Publishing Ltd. Assigned by Grabbing Hands Music Ltd. Recorded at The Garden Studios, London. Mixed at Hansa Mischraum, Berlin. 5-10 published by EMI Music Publishing Ltd. Assigned by Grabbing Hands Music Ltd. / Sony Music Publishing (UK) Ltd. Recorded at The Garden Studios, London. 6-1 published by Habana Music Publishing Ltd. Recorded at The Garden Studios, London 1983. 6-2 published by Habana Music Publishing Ltd. Recorded at The Garden Studios, London 1983. Mixed at Aosis Studio, London. 6-3 published by EMI Music Publishing Ltd. Assigned by Grabbing Hands Music Ltd. Recorded at The Garden Studios, London. Mixed at Hansa Mischraum, Berlin. 6-4 published by BMG Music Publishing Ltd. Recorded at Aosis Studio, London. 6-5 published by Musical Moments Ltd. / Sony Music Publishing (UK) Ltd. Recorded at Splendid Studios. 6-6 published by Musical Moments Ltd. / Sony Music Publishing (UK) Ltd. / Cherry Red Music Ltd. / Complete Music Ltd. Recorded at Splendid Studios. 6-7 to 6-10 published by Birthday Party PTY. Recorded at Hansa Studios, Berlin (April 'LXXXIII). Reworked at Britannia Row Studios, London (August 'LXXXIII). 7-1 published by Interzone Music Publishing Ltd. August 1981. 7-2 published by Interzone Music Publishing Ltd. April 1981. 7-3 & 7-4 published by Habana Music Publishing Ltd. Recorded at Hansa Tonstudios, Berlin November 1983. 7-5 published by Gema / Warner Chappell Music Ltd. Annie Lennox appears by kind permission of RCA Ltd. Record Division. Recorded at Jacob's Studio, Surrey, England. 7-6 published by Gema / Warner Chappell Music Ltd. Recorded at Jacob's Studio, Surrey, England. 7-7 published by EMI Music Publishing Ltd. Assigned by Grabbing Hands Music Ltd. Recorded at Hansa Tonstudios, Berlin. 7-8 published by BMG Music Publishing Ltd. Recorded and mixed at Aosis Studio, London. 7-9 published by Habana Music Publishing Ltd. Recorded at Hansa Tonstudios, Berlin November 1983. 7-10 published by Habana Music Publishing Ltd. / Mute Song Ltd. Recorded at Blackwing Studios, London 1982. 8-1 published by Sony Music Publishing (UK) Ltd. Recorded at Trident Studios, London March 1984. 8-2 published by Mute Song Ltd. Recorded at Trident Studios, London March 1984. 8-3 published by Mute Song Ltd. Recorded at Aosis Studio, London. 8-4 published by Mute Song Ltd. Recorded at Blackwing Studios, London. 8-5 & 8-6 published by Mute Song Ltd. Recorded at Blackwing Studios, London. 8-7 to 8-10 published by EMI Music Publishing Ltd. Assigned by Grabbing Hands Music Ltd. Recorded at Music Works, London mixed at Hansa Mischraum, Berlin. 8-11 & 8-12 published by Mute Song Ltd. / Habana Music Publishing Ltd. Recorded at Blackwing Studios, London May 1981. 9-1 published by Cherry Red Music Ltd. / Complete Music Ltd. Recorded on the 6th March 1979. Originally released through Rough Trade in 1980. 9-2 to 9-5 published by Mute Song Ltd. Recorded December 75 - January 76. 9-6 to 9-9 published by Habana Music Publishing Ltd. Recorded at the Hacienda, Manchester 28th February 1984. 10-1 published by EMI Music Publishing Ltd. Assigned by Grabbing Hands Music Ltd. Recorded at Blackwing Studios, London. 10-2 & 10-3 published by Musical Moments Ltd. / Sony Music Publishing (UK) Ltd. Recorded at the Hammersmith Odeon on th 25th October 1982. Mixing performed at Blackwing. 10-4 published by EMI Music Publishing Ltd. Assigned by Grabbing Hands Music Ltd. Recorded at The Empire Theatre, Liverpool on the 29th September 1984. Mixed at The Graden Studios, London. 10-5 published by Musical Moments Ltd. / Sony Music Publishing (UK) Ltd. Recorded at The Empire Theatre, Liverpool on the 29th September 1984. Mixed at The Graden Studios, London. 10-6 published by Mega Music Ltd. / Sony Music Publishing (UK) Ltd. Recorded for Radio 1's David Jensen Show at Maida Vale Studios, London. First broadcast 16th September 1982. 10-7 published by Musical Moments Ltd. / Sony Music Publishing (UK) Ltd. Recorded for Radio 1's David Jensen Show at Maida Vale Studios, London. First broadcast 16th September 1982. 10-8 published by Mega Music Ltd. / Sony Music Publishing (UK) Ltd. Recorded by the BBC at The Dominion, London on the 22nd November 1982. 10-9 published by Musical Moments Ltd. / Sony Music Publishing (UK) Ltd. Recorded by the BBC at The Dominion, London on the 22nd November 1982. 10-10 published by Musical Moments Ltd. / Mega Music Ltd. / Sony Music Publishing (UK) Ltd. Recorded by the BBC at The Dominion, London on the 22nd November 1982. 10-11 published by Mute Song Ltd. / Chrysalis Music Ltd. Recorded for Radio 1's John Peel Show at Maida Vale Studios, London. First broadcast 9th April 1984. I have a copy signed by mr Miller himself. How cool is that? Just a note- 50 copies autographed by Daniel Miller were randomly distributed when purchased via the Mute website. A monument for this great label. For many out there reaching Mute for the first time, this box of treats is an absolute must in terms of introduction - but for the rest (unless you're a slave to your own die-hard collector's weaknesses) it might feel like a wicked trick; besides early singles from DAF ('Tanz Mit Mir' and 'Kebab Traume'), Robert Rental ('Double Heart') and Non (one minute 45 RPM cuts of Boyd Rice's lock grooves falling flat to CD), being long gone and out of print on vinyl, plus a selection of Yazoo BBC sessions and live outtakes, you might throw away the money for what you already have - an enormous amount of Depeche Modes and Fad Gadgets plus occasional Nick Cave that chronologically fits but musically stands out of the lot. 'Mute Audio Documents' shouldn't stop here (and probably won't) - besides its chronological aspect, it's still a typical cash-in moment with only tiny twitches of hard-to-find material.